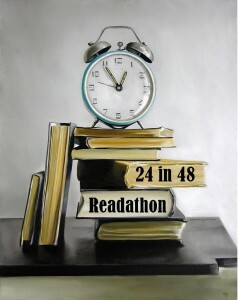 I participated in Rachel's #24in48 readathon last summer, and relished the opportunity to read for a solid weekend. My librarian cousin joined me for the weekend as a reading buddy, and together, we curled up on the couch with book-themed bottles of wine (having a librarian/bookworm cousin is good for those kinds of things), snacks, and stacks and stacks of books. It was so lovely that I'll be joining again this year, and you should too! The goal: Read for 24 hours in a 48 hour window (specifically,12:00am on Saturday, Aug. 3rd to12:00am on Monday, Aug. 5th). My pledge: As with previous readathons, I'll be donating $0.05/page to a literary charity. This time, I've selected First Book, an organization dedicated to providing access to new books for children in need. I'll post my reading stack closer to the date of the event, and it will inevitably be far too ambitious and large and overwhelming but also wonderful. Cool! Good luck with your reading. Fun!! I hope you have a great time! This sounds fun! Work permitting, I might do this. I'm leaning towards starting Gaddis's J R soon, so that would give me a hefty foundation to take into this. I adore this idea! I think that this is a great way to read more and to help out with charity. Thank you for sharing this awesome idea.